When you look at the most successful people in the world, they all have a few things in common. They tend to have a residence in a few different countries, several high-end vehicles in their multi-car garages, and take vacations in some of the most beautiful places around the globe. However, those that are considered to be the highest 1% have one thing that not everyone will ever be able to call their own: a yacht. Now, just any old yacht won’t do for those that have grown accustomed to the finer things in life. They expect a much higher level of luxury and the yacht manufacturers deliver in a quite incredible fashion! If you’ve ever dreamed of owning your own yacht, take a look at some of the world’s most luxurious seafaring watercrafts for inspiration. Originally built in 2004 for the CEO of Oracle Corporation, Larry Ellison, the Rising Sun is the 11th largest yacht in the world. The current owner is quite notable in his own right, David Geffen, an entertainment industry mogul that founded two record labels and the well-known Dreamworks movie studio. Worth $200 million, this stunning yacht is basically a mansion on the water and comes fully equipped with gymnasium, sauna, wine cellar, cinema, basketball court, and even a helicopter pad. The bathrooms have Jacuzzi tubs, the counter tops are made out of onyx, and the 36,000 square feet of decking is comprised of teak. Even being filled to the brim with such accommodations, this megayacht can still get up to 28 knots with a cursing speed of 26 knots. 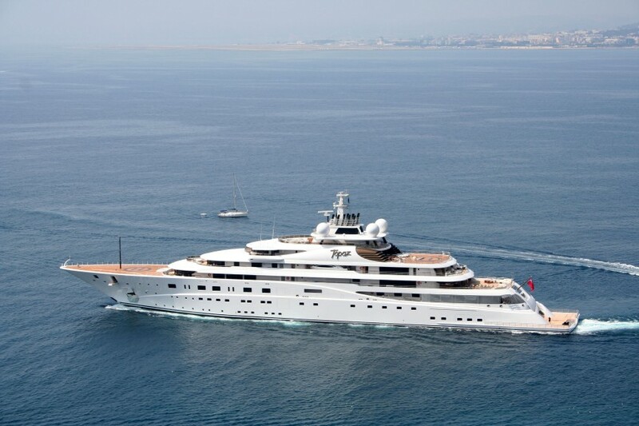 When you’re rich enough to drop $300 million on a superyacht like the Sultan of Oman, Qaboos Bin Said Al Said did, there is no shame in naming it after yourself. 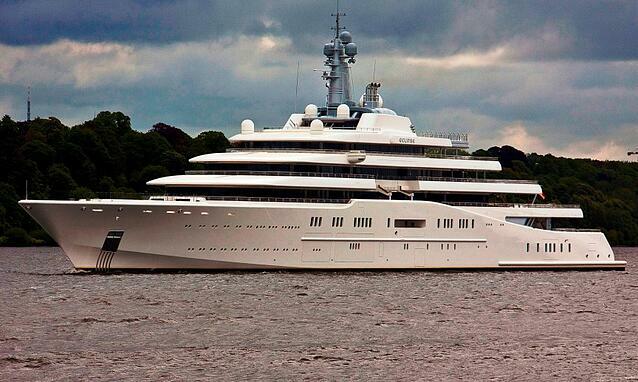 When this yacht was constructed, it was the second largest yacht in the world. It’s now just the fourth largest at a little over 508 feet. Should the sultan ever feel the need to take 70 of his closest friends and family on a trip around the world, this yacht can handle it. That’s not even including space for 154 crew members that ensure it runs smoothly. Not much is known about the interior since he has refused pictures from being taken, but we hear there’s a concert hall inside, so one can only assume the opulence inside is quite spectacular. This extravagant superyacht is currently the largest in the world, but honestly, that designation won’t last for long, as you’ll see in the next entry. The Eclipse has been estimated to be worth around $377 million and is owned by Roman Abramovich, a Russian tycoon worth a whopping $9 billion. Not only does the Eclipse have such extravagant features as two swimming pools, two helicopter pads, three launch boats, and even a submarine, it also has a pretty impressive security system. The defense system detects intruders and even uses high-tech light technology to prevent people from taking pictures of the monstrous boat. When the Streets of Monaco is completed, it will be worth an eye-watering $1 billion or more. The brainchild of Yacht Island Design, Streets of Monaco will basically be a floating city you can take around the world with you. Since it’s modeled after the city of Monaco, it won’t look like a traditional yacht. Because of this, one shouldn’t be surprised that it will offer some pretty fantastical features never before included in typical yacht designs. In addition to a ship deck that resembles one of the most architecturally beautiful cities in the world, the potential billionaire owner will also be able to enjoy a private beach and man-made lake. The build plans include spas with a sauna and private massage suites. The guest suites are as spacious and opulent as some of the most high-end hotels and the owner’s suite will even include a working fireplace. The designer of this opulent and luxurious superyacht obviously has an overactive imagination that will yield some lucky owner their own floating paradise. Some of these yachts are already out on the water, dropping anchor in some of the most exclusive ports around the world. Make your dreams a reality and maybe the next time we feature luxurious yachts from around the world, yours can be included!